It took me several days but it got done. 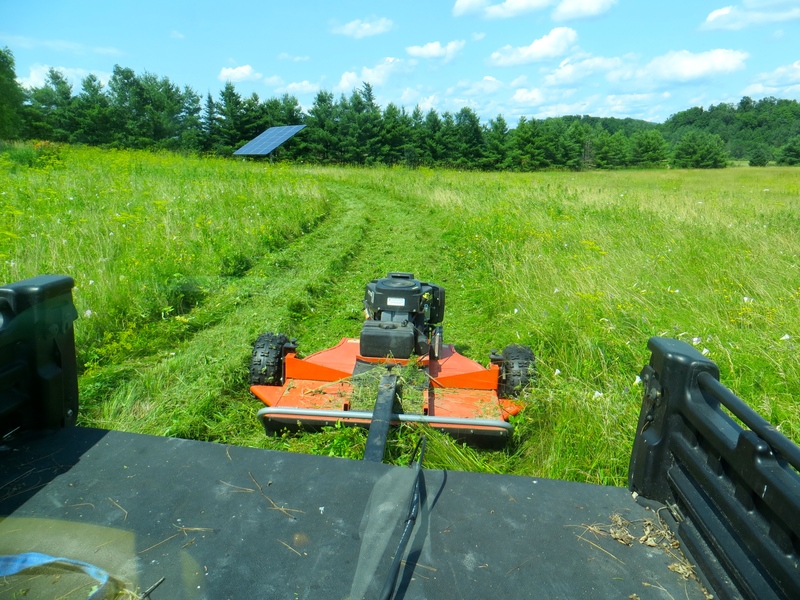 Every year I try to mow our ten-acre field at just the right time–in the three-week window after July 4th. Completion date this year: July 13. We mow the field because Meadowlarks nest there. And Red Winged Blackbirds. And Savannah Sparrows. And, if we are lucky, Bobolinks. If we manage it well, and grasses grow more than other plants, then Bobolinks will nest there. It is because birds nest in the field that we wait until July to cut it. Once the chicks have fledged for these ground nesters, we can pass over those empty nests with sharp spinning blades. Baby birds don’t do well with sharp spinning blades. We have to cut late enough for the birds but we are also cutting to keep the Wild Parsnip at bay. I’ve been reading lately about Giant Hogweed. That is a similar plant that is becoming more widespread. Rub against it, get the oil on your skin, get some sun exposure and get some nasty burns. Giant Hogweed isn’t around here yet. But Wild Parsnip has been around for years. If we keep cutting, then the stuff will be held back. Already there is less of it. And the plants are smaller. It seemed to flower later this year, too. But it won’t go away without management. The key is to cut it before it goes to seed. Cut it too late and it just spreads the seeds around. With this year’s cutting, we’ve got two years in a row of good timing. I’m hoping the field has even fewer yellow flowers next year. I cut it over the span of a week. The first day I cut a big chunk. I would have kept going but going through the big patch of quack grass in the corner (another invasive species I’d like to reduce) I turned around to see clouds of smoke rising from the brush mower. It had happened before. Busted belt burning up. That quack grass is thick stuff. My wife bought a new belt the next day and together we replaced it. In the past I’ve hauled the mower to the repair shop down the road. But that costs money and, more importantly, time. Thanks to YouTube, however, we felt confident enough to disassemble the machine and make some repairs. Once we tightened those last nuts back up we were back in business. We have a few Wild Parsnip plants kicking around the edges. I’ll have to cut those manually. With some long clippers. And gloves. After the sun goes down. But mostly, project done. At least for this summer. One of my favorite sounds of spring and summer is the song of the Meadowlark. That sweet whistling tune makes me smile every time I hear it. This year they nested in our field. Starting a few years ago they were around, nesting in surrounding fields and sharing their songs. Now they nest right here in our meadow. By mid-July, chicks have fledged. We had a half dozen young birds zipping around, buzzing out their calls rather than their songs, done with nests for now. Other birds were out of their nests as well–Red-Winged Blackbirds, Savannah Sparrows, Bobolinks, Snipes. Birds fledged and Wild Parsnip not yet gone to seed? That means time to cut the field. I had powered up our tow-behind brush hog in June. I wanted to make sure it started, that the blades spun, that it worked. So when mid-July arrived and the weather cooperated I hooked up the mowing system and got started. Unfortunately, after one pass of one edge of the field, smoke started pouring out of the brush hog. Dang! Busted belt. No more mowing. There is a repair shop right up the road, so I just kept on going. It was Friday, of course, but they assured me getting parts is pretty quick these days. So I’m thinking they order a belt on Monday, put it on and maybe Wednesday I’m in business, best case scenario. But since I didn’t hear from them I called after a week. They had an estimate for me. Seriously? I’m hoping the thing is ready to go and they haven’t even ordered the belt? So, giving them the go-ahead, I patiently waited some more. After another week I called again. It was still not done–complications, other parts needed, rust involved. After another couple of calls and another week, it was finally good to go. I picked it up Saturday morning, just before the place closed. It ran like a charm. So I headed out to field, three weeks after I started, Wild Parsnip now starting to go to seed, and started cutting. I wasn’t sure just how much I could get done that day, but after about eight hours, I had most of it cut. It was a long afternoon/evening. I had planned to stop by 9:00 pm and stopped about ten minutes before that hour. I probably spread a few Wild Parsnip seeds but not too many, I hope. I left a couple of patches uncut but, since we planned to head out for a week the next day, it would have to do. The birds were definitely cleared out by the time I started cutting. I missed my window between ground-nesters fledging and seeds falling by a bit but hopefully not by too much. If I can get out there and cut once more this fall, the Parsnip should be checked for this season. That stuff is aggressive and I need to keep at it. What I want is for grasses and native wildflowers to grow. I want better habitat for the birds and more food for the pollinators. It has been a long project and may take a good deal more time yet. In the meantime I can look out over the cut meadow with relief. I don’t see those tall stalks with yellow flowers turning brown with seeds. I don’t hear much birdsong now, but come spring I look forward to the Meadowlarks, flying low across the greening field, whistling their tunes once again. 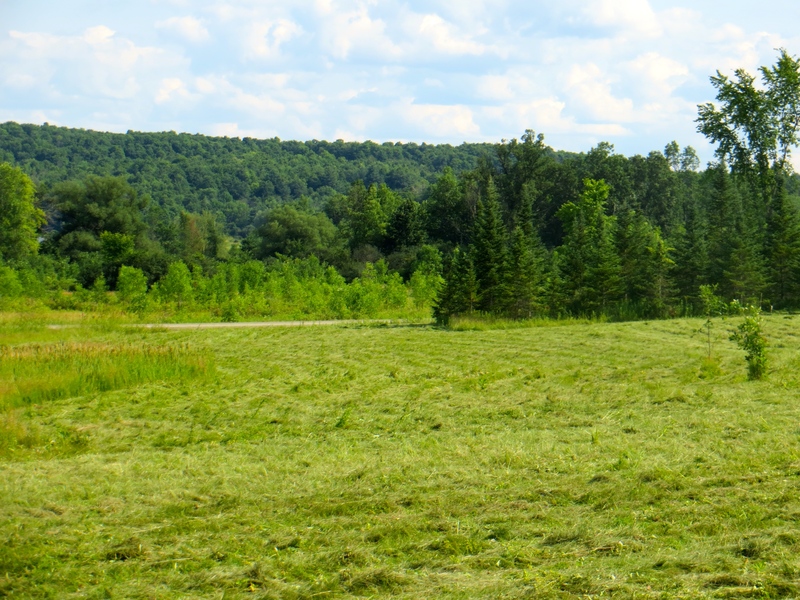 This is the time of year when we get around to mowing our field. We have ten acres of meadow. When we moved here it had not been cut in several years and it was starting to get scrubby. Cattails grew in a wide swath. Ash trees were sprouting and willows were standing out among the grasses and wildflowers. Actually, the grasses were pretty limited. 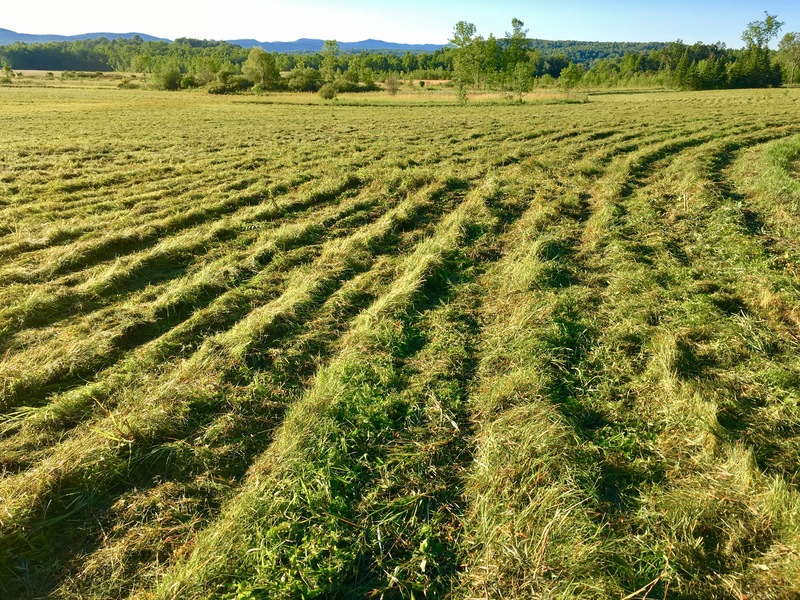 The field had long passed the point of being suitable for haying. We wanted to turn that around. One reason we wanted to turn it around was Bobolinks. There were Bobolinks nearby, in adjacent fields and up the road, but none in our field. It was just too overgrown. 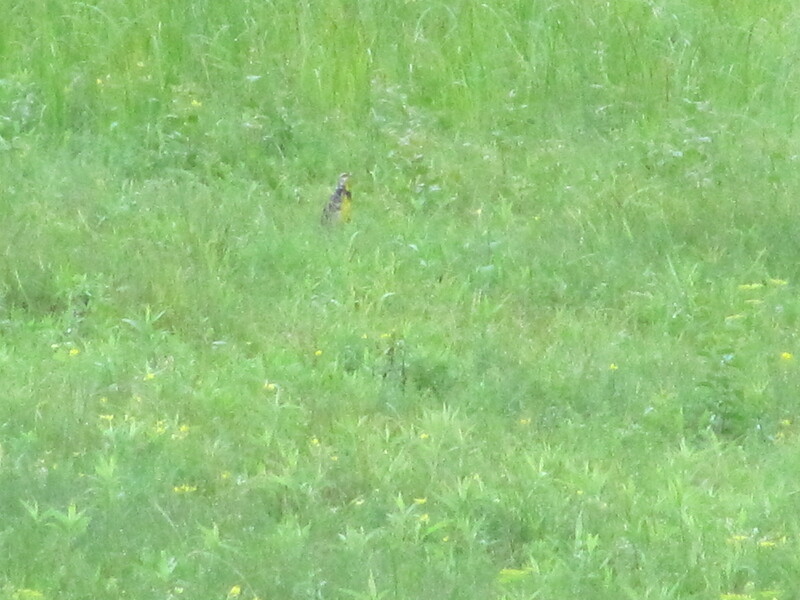 They like to nest in grasslands and our meadow was quickly reverting to woodland. We borrowed a tractor with a brush hog and cut it, cattails and all. We did the same thing the next year. We were not, however, especially deliberate about it. We cut it when we had access to a tractor and it worked. Grasses started to grow and it looked good. I have learned a bit about this small habitat of ours since those early years. First, we have three invasive plants (more I am sure but three major ones): wild parsnip, purple loosestrife and reed canary grass. The purple loosestrife was the worst at first and those early cuttings really made a difference. We still have it but it hardly dominates like it did. It has beautiful flowers which get visited by butterflies and hummingbirds, so it is hard to hate it, but I would rather it did not take over. The reed canary grass I started learning about recently, even though it was pointed out a few years ago. It, too, is a beautiful plant, which is why it and purple loosestrife are both used as ornamentals. It grows in thick mats and apparently can be hard to eradicate. This grass isn’t too bad yet–we have a few patches but it has not taken over. The real villain is the wild parsnip. When we first encountered this plant we thought it might be wild dill. It is tall with yellow large-headed flowers. I looked it up and learned that the roots are edible, hence the name. It is, however, not a pleasant smelling herb or a ready food source. It is a menace. There are fields where wild parsnip has simply taken over. The plants can get to be super tall–eight feet sometimes–and they will push out native plants. I have seen fields where it is the only plant visible. If those fields eventually grow up into woods the wild parsnip will disappear, but in sunny fields it is a bully. Moreover, the plant is toxic. The oil from the plant can rub off and, when exposed to sunlight, can cause chemical burns. Photoreactive is the word. In short, we wanted to make sure it does not live in our field. 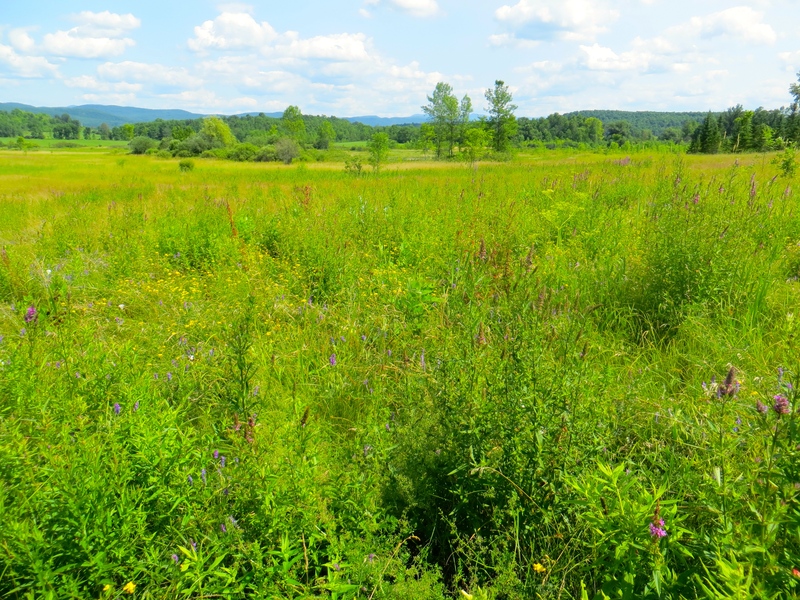 The solution would be to simply cut the field several times a year to keep invasive plants from growing and to let native grasses grow up. So simple. The problem is that birds nest on the ground. Bobolinks have started to nest in our field since we started cutting. Also nesting on the ground: Red-Winged Blackbirds, Savannah Sparrows and, most recently, Eastern Meadowlarks. The biggest enemy of these birds is the mower, so cutting when the birds are nesting is bad juju. Now we try to be deliberate about when we mow. The trick is to wait long enough for chicks to have fledged but to get to it before the wild parsnip has gone to seed. That would be right about now. Pretty much. Red-Winged Blackbirds and Bobolinks are hardly around at this point, so I am not worried about them. The Meadowlarks, however, are still chattering away and flying all over. They may be on egg clutch number two, and there are at least two pairs. This year the compromise was clear–cut the front part of the field where the parsnip is the worst and leave the back part of the field, where the birds are nesting, to be cut in a couple of weeks. Yesterday, after mechanical issues that finally got solved, I got on that. It was like scratching an itch. Mowing down those wild parsnip plants, several of which were taller than me, felt good. I was relieved that, unlike last year when I cut it, none of it had gone to seed yet. Phew. There is still more of the field to cut, of course, and wild parsnip is in there. Hopefully, however, because so much of it is newer growth, it won’t be too bad. I may look to do a second cutting in October or November. That would help with the canary grass, and the birds will be heading south by then. I thought I might do that last year and never got to it, however, so I’m making no promises. As I write this Meadowlarks are calling and Savannah Sparrows are singing. Leaving the most grassy part of the field for now is clearly the right choice, but I will look forward to seeing those yellow wild parsnip heads get shredded when I finish the job. When we moved off the mountain to our home in the valley a few years ago, it gave me a chance to learn some new birds. I knew most of the birds I saw and heard when we lived a couple thousand feet higher, but those birds do not live down here. I learned the bobolink, flitting about the fields, and was happy to know they were fairly abundant. I learned the song sparrow. I got to know the barn swallow. This year I heard a song I had been missing, either because it was not there, or because I simply wasn’t paying attention. I thought it was a meadowlark. So I looked it up with the power of the internets. Sure enough, at the Cornell Lab of Ornithology and its All About Birds web site, I checked the song I was hearing with a recorded one. Eastern Meadowlark is what we had. I kept looking for them and not seeing them. I would hear the yellowish rascal but not see it craftily hiding in the tall grass. See See SEE-yeer. I saw one today, however. I sat drinking my foamy coffee drink, eating raspberries and peaches with yogurt and granola, when I heard the call. I mean, I literally heard the call, of the meadowlark. So I scanned the field with binos and eventually saw the little dude poking his head up and singing. It kept popping up and down in the grass but I got a good enough look to get a visual confirmation of the species. I do not want to drive away the meadowlarks (or bobolinks or song sparrows) but I do want to cut the field. We will have to monitor the birds to see that we do as little damage as possible. It is good to know that these birds are definitely here. I would hate to push them out just as I am getting to know them.